A better emergency solar still? Last year, I wrote a couple of posts about "Books that influenced me growing up." One of the books discussed was a copy of a US Air Force survival manual that my Dad bought for me at the Redwood Trading Post and which became one of my favorite books to browse, skipping around from one climatic region to another (it was organized by climatic regions, with sections on specific survival considerations for "moist tropics," "deserts," "on sea ice," and so forth). Like many survival books, that Air Force manual contained a discussion of the design of a "solar still" for obtaining water in a survival situation. I would later receive training on the construction of just such a solar still during the desert phase of the US Army's Ranger School (apparently the desert phase has since been discontinued). A solar still can be made from a sheet of clear plastic stretched over a hole in the ground. Whatever moisture is in the soil plus that from plant parts (fleshy stems and leaves) when they are used as a supplementary source, will be extracted and collected by this emergency device. Obviously, where the soil is extremely dry and no fleshy plants are available, little, if any, water can be obtained from the still. However, in such situations, the still can be used to purify polluted water such as body wastes. The parts for the still are a piece of plastic film about six feet square, a water collector-container or any waterproof material from which a collector-container can be fashioned, and a piece of plastic tubing about 1/4 inch in diameter and 4 to 6 feet long. The tubing is not essential, but makes the still easier to use. A container can be made from such material as plastic, aluminum foil, poncho, emergency ration tins, or a flight helmet. The tubing, when it is available, is to be fastened to the bottom of the inside of the container and used to remove the drinking water from the container without disturbing the plastic film. Some plastics work better than others. Almost any clear plastic film should work, if it is clear, strong, and "wettable." That is, it should be the kind which, when water drops form on the under side, causes the drops to cling to the plastic and run down to drip into the container instead of dropping off where they form. If fleshy plants are available, or if polluted water is to be purified, the still can be constructed in any convenient spot where it will receive direct sunlight throughout the day. Ease of digging will be the main consideration. If soil moisture is to be the only source of water, some sites will be better than others. Seek a place where there is reason to believe the soil will contain more moisture. A stream bed, even though dry, or a depression where rain water has collected will stay moist longer than other areas. Generally clay soil is better than sand because it holds more water longer. (In any case, after prolonged dry periods the yield from any soil alone may be small). Although sand generally does not retain as much moisture as clay, a wet sand will work very well. Along the sea coast or in any inland area where brackish or polluted water is available, any wet soil, even sand, produces usable amounts of water. On cloudy days, the yield will be reduced because direct sunlight is necessary if the still is to operate at full efficiency. Certain precautions must be kept in mind. If you use polluted water, make sure that none is spilled near the rim of the hold where the plastic touches the soil and that none comes in contact with the container, otherwise there is a chance that your freshly distilled water will be contaminated. Do not disturb the plastic sheet during daylight "working hours" unless it is absolutely necessary. If a plastic drinking tube is not available, raise the plastic sheet and remove the container as few times as possible during daylight hours. It takes from 1/2 to 1 hour for the air in the still to become resaturated and the collection of water to begin again after the plastic has been disturbed. [AFM 64-3 dated 15 August 1969, pages 4-13 through 4-14]. Some time ago, I came across a web site containing an entry by a "Jim B." discussing several revolutionary upgrades to this standard solar still, some of which take into account the importance of orienting the still in the correct direction based on your location on our planet. In a post entitled "The Extreme Solar Still Concept," Jim describes some of the drawbacks of the classic survival still and the upgrades he came up with for his version, which he calls a "D'still" and which may improve water collected by as much as 400% over the conventional version. Jim alters the shape of the original still to resemble a seashell when viewed from above, with the catchment container located towards the base of the shell rather than right in the center the way it is in the conventional still described by the Air Force manual above. Here is a link to his diagram of the top view of his enhanced still, showing the seashell shape (east and west appear to be mistakenly reversed in that diagram, unless I am misreading something of the intent of the labels). 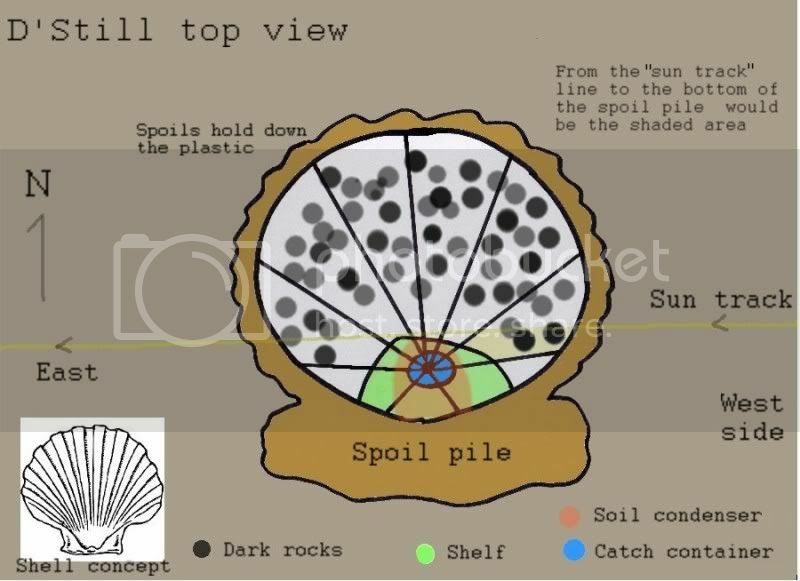 Importantly, he recommends orienting the top of the "seashell" towards the north (for those in the northern hemisphere), in order to arrange the larger slope area towards the sunshine. To understand the reasoning behind this concept, it is helpful to look at Jim's second diagram, which is a cutaway or side view of his still. Due to the tilt of the earth's axis (see the discussion in this previous post for more detail), the sun will always travel south of an observer who is located north of the Tropic of Cancer (the northern tropic). The enhanced still features a large, gentle sloping northern section (the top part of the shell), which is oriented to face the south and catch full force of the sun's rays (see also the diagram below, where I have drawn my own version of the cut-away view). The enhanced still also features a steeper berm at the southern end, which casts a shadow over the catchment portion of the tarp and the shelf below that holds the water-container. By orienting the still with the shell's top facing north (if north of the northern tropic, otherwise face it south if south of the southern tropic -- if between the two tropics, you will have to orient the "top of the shell" away from the track of the sun for that particular time of year), the sun's path will create this shade if you use spoil to build up the southern berm as shown in the diagram. Jim's diagram shows (and his article explains) that you can also pile up additional vegetation atop this southern berm in order to ensure shade over the condensing area. 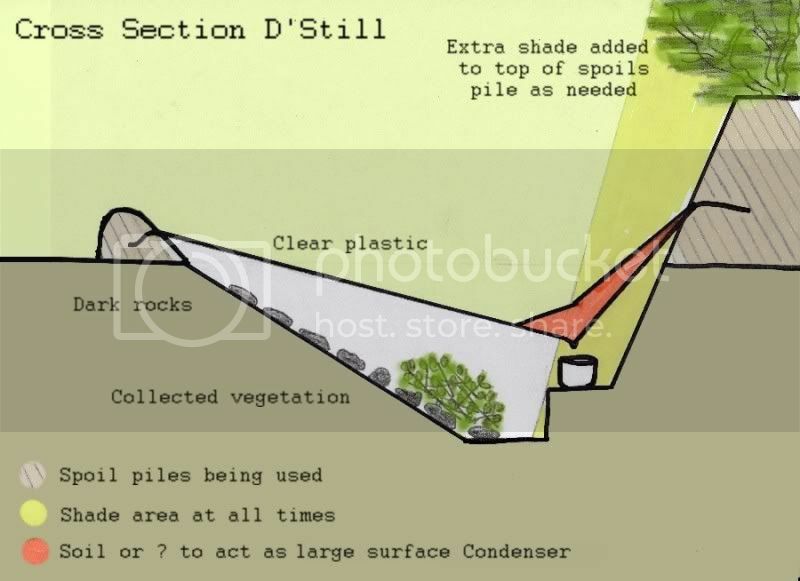 The rest of the article explains the other features of the enhanced solar still, including the addition of some cool (preferably moist) soil above the weighting rock which holds the tarp's lowest point above the catchment container. In order to understand the entire concept of the enhanced or "extreme" solar still (or "D'still") it is recommended that you read that entire article -- and even better, go out and try constructing one yourself just for practice. We can all hope that we never need to resort to a solar still in an emergency survival situation. However, if ever we do, we can be grateful to "Jim B." for his ingenious enhancements to the classic solar still design.